Graduate students Negar Nikpour, Aqib Sunesara and Ankita Jaiswal took home first place during the 2017 APICS Terra Grande District Competition, securing a spot to compete at the national level in October. Three graduate student teams from the C. T. Bauer College of Business swept a recent district supply chain competition, earning the top three spots at the 2017 APICS Terra Grande District Competition and besting competitors from Sam Houston State University, UT Dallas, UT El Paso and Texas A&M University. 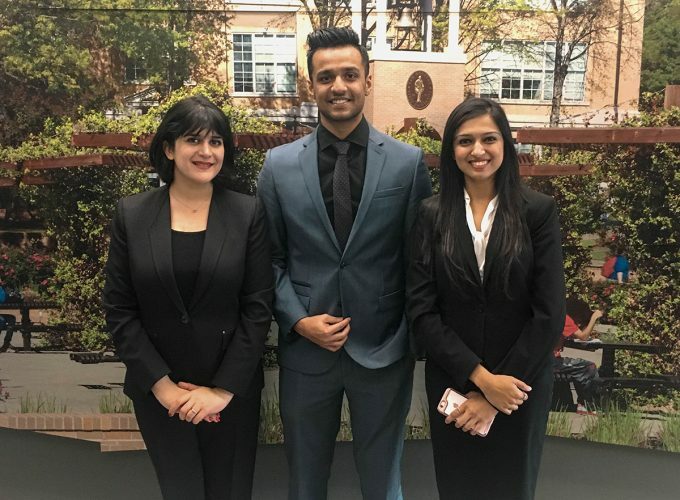 The first place team (MBA students Aqib Sunesara and Ankita Jaiswal and MS Supply Chain student Negar Nikpour) received a $1,500 prize. During the competition earlier this month, students were tasked with improving the sales, purchasing, supply chain and operations of a company with a negative ROI — skills they’ve learned to master throughout their time at Bauer. Prior to the competition, Clinical Assistant Professor Gordon Smith advised participants and offered guidance on how to apply the skills they’ve learned in class to real-world situations. “It was a wonderful opportunity for us to learn more about actual operations before entering the market so that we can see the actual results when we apply what we’ve learned in our courses,” Nikpour said. The top team also won the opportunity to represent the Terra Grande District in the 2017 APICS Annual International Conference this October, where they will compete against winning teams from APICS districts in the United States and around the world. The 2017 competition victories add to what has become a winning tradition for Bauer supply chain students, Dean Latha Ramchand said.